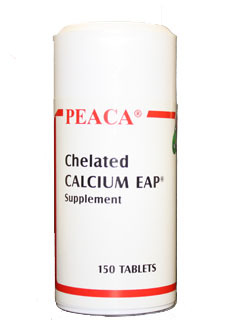 Calcium EAP (aka Colamine Phosphate) is chelated Calcium-2-aminoethanolphosphate, or Calcium Colamine Phosphate. Nine tablets contain 3150 mg of Calcium EAP (elemental Calcium 396 mg.) This is 350 mg of Calcium EAP (44 mg of Calcium) per tablet. This is a calcium supplement. Take 2 to 9 tablets daily according to your health practitioner. Supplies oxygen, minerals, enzymes, and more. The next generation silver. The professional version of Sovereign Silver. Now in 128 fl ounces (1 gallon).